For research or press inquiries, contact the team at this email address. Power (vs. submissiveness) connotations capture implied authority differentials between the subject and the object of the verb. For instance, in the sentence "he implored the tribunal to show mercy", "he" is implied to be in a submissive position compared to "the tribunal", as signaled by the verb "implore". Conversely, in "he demanded mercy from the tribunal", "he" is described with much more authority over "the tribunal". 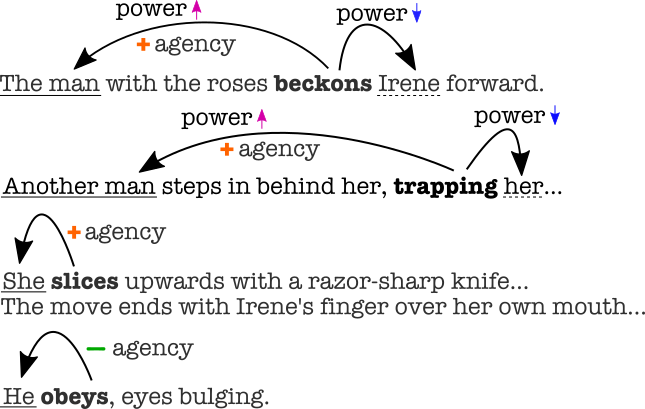 Agency (vs. passiveness) connotation frames uncover the implied agency given to the subject by the verb. For example in "she searched for her prince", "she" is the driver of her own life (positive agency), which isn't the case in "she waited for her prince", where "she" much more passive. We then apply our connotation frame tool to these movie characters, giving each character four connotation scores (high power, submissiveness, positive agency and passiveness). For instance, think of a submissiveness score as measuring the amount of subordination displayed for a character in the screenplay. With scores computed for all characters, we used statistical tools to uncover bias in how much power and agency female and male characters have. *We acknowledge that this is over-simplifying the construct of gender, which lies on a spectrum. Through our statistical analyses, we found that women were consistently portrayed in more submissive positions and with less agency than men, in ways that reinforce gender stereotypes. We also find that men tend to speak more in imperative sentences (e.g., "Bring me my horse. "), and women tend to hedge their statements more (e.g., "Maybe I am wrong."). We also compare our connotation scores for each movie to its Bechdel rating, finding that movies with positive-agency, plot-driving women tend to fail the Bechdel test. Perhaps movies are less likely to contain a lot of positive-agency female characters. (similar observations inspired the Mako Mori test). How much power do female/male characters have in this movie? Bars show how much power (or submissiveness) male (in blue) and female (in red) characters have in this movie. High power scores represent how often verbs imply that a character has more authority, averaged across characters in the movie. For example, "she handcuffs Y", where "she" is implied to have more power than Y, counts towards the female high power score. More high power for male characters indicates that the movie represents men with more power/authority than women. Submissiveness scores represent how many times verbs put characters in a subordinate position, averaged across characters in the movie. For instance, "he apologizes to Y" implies "he" is in a submissive status compared to Y, and counts towards the male submissiveness score. More submissiveness for male characters indicates that men are represented in more subordinate situations than women. Note: a movie can have both more high power and more submissiveness for male characters. It just means that, generally, male characters were involved in more actions than women. How much agency do female/male characters have in this movie? Bars show how much agency (or passiveness) male (in blue) and female (in red) characters have in this movie. Positive agency scores represent how often verbs imply positive agency (or decisiveness) for a character, averaged across characters in the movie. For example, "she beat the enemy" counts towards female positive agency, since it implies "she" has positive agency, is decisive and driving her destiny. More positive agency for women means women are driving the plot more often than men are in this movie. Passiveness scores represent how many verbs imply negative agency and passiveness for a character, averaged across characters in the movie. For instance, "she experienced a change" implies "she" has little to do with why "a change" is happening, and counts towards the female passiveness score. More passiveness for women implies the movie represents them as experiencing the plot more than men. Note: a movie can have both more positive agency and more passiveness for female characters. This indicates that there's a tendency in the movie for women to be involved in more actions. Also note that passiveness scores are often lower than positive agency scores, because verbs are more often used to describe active situations, leaving out explicit passiveness descriptions. How many words are spoken by or written about female & characters? Excerpt from Sherlock Holmes (2009), showcasing how verbs carry information about the actors they describe. Gender bias in character portrayals in movies. Example verbs from our connotation frame tool.